Westfield Wheaton is easily accessible by Metro rail. Take the Red Line to the Wheaton Metro station. Then take the bridge crossing Viers Mill Road to the mall. C2 to Randolph Rd. & Parklawn Dr. The easiest path to center from the Northern Montgomery County is to take I-270 South to I-495 East to exit 31 for MD-97/Georgia Ave. toward Silver Spring/Wheaton. Keep right at the fork, follow signs for MD-97 North and merge onto MD-97 North/Georgia Ave.
Take a slight left onto Veirs Mill Road, and our shopping center will be located on your left. If you're coming from the West or Virginia, take I-495 North to Exit 33A (Connecticut Ave./Kensington). Bear left onto Connecticut Ave. and merge right onto University Blvd. Our shopping center will be on your right. The easiest path to the center from the District of Columbia is to take 16th Street North to Georgia Avenue North and follow across the beltway towards Wheaton. If you are coming East from Baltimore or Prince Georges County, follow I-495 West toward Silver Spring and take exit 31 for MD-97/Georgia Ave. toward Silver Spring/Wheaton. Keep right at the fork, follow signs for MD-97 N and merge onto MD-97 N/ Georgia Ave. If you're coming from the north or Columbia, MD, take US-29 South and turn right onto University Blvd West. Follow University Blvd towards Wheaton, and take a left on Veirs Mill Road. There are more than 6,500 free parking spaces at Westfield Wheaton. Barwood Cab will pick up at any Westfield Wheaton exit. Please call 301.984.1900 for reservations. CAPITAL BIKESHARE PROGRAM NOW IN WHEATON !! The Capital Bikeshare system is a 24/7 self-service bike rental program to empower users to make relatively quick, short distance rides around town. 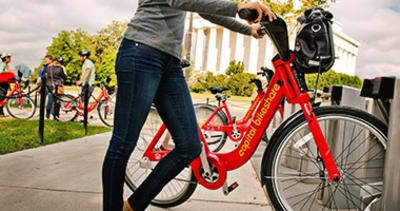 The first 30 minutes of use with a Capital Bikeshare bike is always FREE and longer rides incur usage charges. The Capital Bikeshare system has 3,500 bicycles at 400 stations across Washington, D.C., Arlington and Alexandria, VA and Montgomery County, MD. Various membership options are available. Now Downtown Wheaton Gets 6 New Capital Bikeshare Stations in Wheaton!! The new Bikeshare network will support the Wheaton Central Business District and surrounding commercial and residential areas. The five stations are located at: Elkin Street and Amherst Avenue; Grandview and Blueridge Avenues; Wheaton Metrorail Station; Amherst Avenue and Prichard Road; and Windham Lane and Amherst Avenue. A sixth station will be added this summer.